Jordan and I enjoyed a stir fry, quasi-harvest meal (greens, carrots, and potatoes were from the garden). In a few weeks, another such stir fry will be completely home grown. But I digress. The reason I bring this supper topic to written word at all is not only because it was so tasty, but because the fresh picked spinach was so very lovely to look at, I just had to snap a quick photo and post it. The picture doesn’t do justice to how deep, dark and rich the green is, and it definitely cannot express the amazing flavor these leaves possessed. Wow. 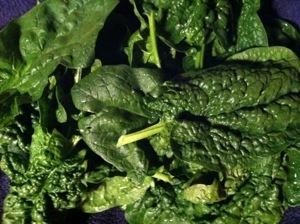 Here is some freshly harvested spinach from last night’s supper.